There was once a linguistic turn. The philosopher Richard Bernstein describes the ascent after WWII of analytical philosophy with its focus on plain language and clear argumentation, as it pushed aside other philosophy deemed imprecise and speculative. But now we have entered the pragmatic turn. Bernstein published a book in 2010 entitled just that: The Pragmatic Turn, stating, “There is a resurgence in pragmatic themes throughout the world, and a growing interest in the works of the pragmatic philosophers” (13). Charles Sanders Peirce (1839–1914) was amongst those pragmatic philosophers undergoing a revival. 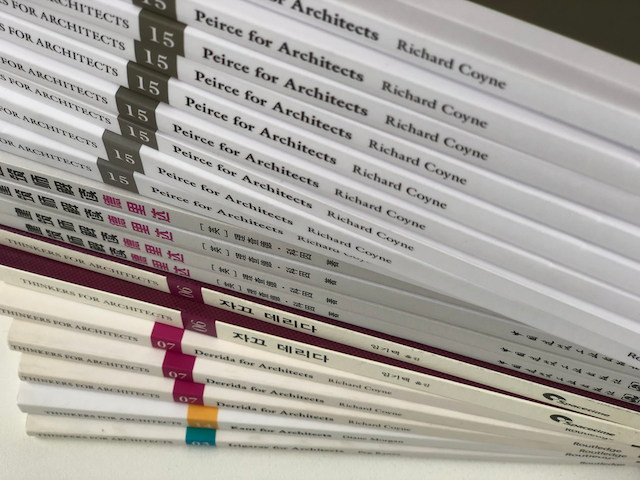 This week I received a pile of author copies for Peirce for Architects, which is my attempt to position architecture within the pragmatic tradition. Most philosophers have delegated Peirce as the leading figure in that philosophical school. Architecture is a practical and pragmatic discipline, and a study of Peirce emphasises architecture as a practice, and a practice grounded in the materiality of the world. Unlike other thinkers headlined in the Routledge book series Thinkers for Architecture (my book is number 15 in the series), there is no “Peircean architecture” as such, and no particular movement, style or body of work that demonstrates allegiance to him. But in so far as any practitioner, educator or critic claims to be pragmatic, they owe a debt, however indirectly, to Peirce’s thinking. There is certainly a linguistic aspect to Peirce’s philosophy. His best-known contribution comes under the heading of semiotics, the theory of signs. A further contribution from Peirce is in the nature of evidential reasoning, that is, reasoning from evidence. Peirce was a great systematiser and organiser of ideas. In fact, he considered himself a logician before he was a philosopher, a logician being someone who resorts to mathematics and formal symbolic systems to study the way people construct arguments and reach conclusions. In Peirce’s words, ‘Logic is the art of reasoning’ (11). I see Peirce as providing a bridge between two modes of architectural thinking: that of the phenomenologists and of the systematisers. Ideas from Pragmatism resonate with Phenomenology and some of Martin Heidegger’s and Merleau-Ponty’s thinking, as well as others of interest within architecture outlined in the Thinkers for Architecture series. There is also much in Peirce that appeals to twentieth-century systematisers in architecture. So, Peirce speaks to mathematicians, logicians, those systems theorists who seek orderly methods for solving the world’s problems, and those of the Design Methods Movement who seek orderly, mathematical and logical procedures for designing buildings. Peirce’s influence extends to digital practitioners and programmers in architecture, and more recently those interested in big data, and responsive architecture that copies biological processes and forms (biomimesis). Peirce speaks to proponents of smart cities, as well as sustainable cities that cope with the challenges of a world in which human intervention has taken on the scale of geological processes – in the age of the Anthropocene. Peirce also speaks to those who conduct digitally enabled forensic analysis of places and spaces. Mathematician and pioneer of computer- aided architecture Lionel March introduced his edited book The Architecture of Form with an examination of Peirce’s concepts of induction, deduction and abduction. It turns out that Peirce’s ideas about logic demonstrate the limits of logic, but also suggest how ideas from formal logic can be recruited in design, and here Peirce’s thinking interacts with theories about the interpretation of places and buildings, that is, Hermeneutics and Phenomenology. I rehearsed several of these themes in blog posts tagged Peirce, but this short book presents Peirce and pragmatism in the form of a more coherent and scholarly narrative. Peirce, Charles Sanders. 1998. Of reasoning in general. In Nathan Houser (ed. ), The Essential Peirce, Selected Philosophical Writings Volume 2 (1893-1913): 11-26. Bloomington, IN: Indiana University Press. “Architecture’s pragmatic turn” reminded me closely Justin McGuirk’s definition of the activist architect – idealistic pragmatists. Thanks for the comment Fabrizio. Karl Marx too advocated practical action to bring about social change, and asserted, ‘All social life is essentially practical.’ A quick scan through Google shows that some scholars have explored the relationship between Marxist thinking and Pragmatism.